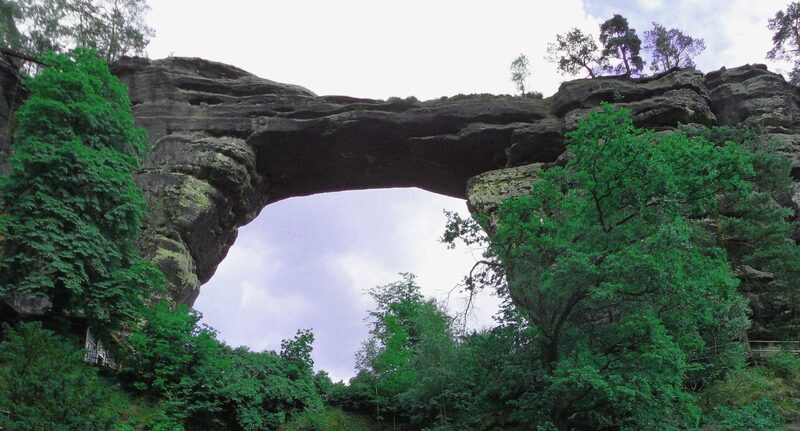 Pravčická Brána is the largest natural stone bridge in Europe and a natural Czech monument, truly one of the most striking natural sites in the Elbe Sandstone Mountains and symbol of the whole region. It is located approximately 3 km North-West of Hrensko in the national park Czech Switzerland not far away from the border to Germany. Wandering paths are leading there both from Czech and German side where Saxonian Switzerland stretches. So this gate and bridge is connecting both countries in a beautiful and stunning landscape and may be visited during opening times for an entry fee. In 1826 an inn was constructed by the gate, and in 1881 Prince Edmund of Clary-Aldringen built there the romantical hotel Sokolí hnízdo (English: Falcon’s Nest) with 50 beds which you can see in the photo hereunder. ‘Brama’ is gate in Polish, so I guessed where you might be leading me. 🙂 🙂 The surroundings look beautiful. Thanks for the link! Fortunately the borders are nowadays just open because it is in fact nice and interesting on both sides (same geological landscape). Thanks for passing by. Interesting area for fans of climbing, but for hiking and wandering also very interesting. The Czechs are renowned for their well organized and superb signed system of wandering paths. We have been there already also at other places of the country for such purpose.